I’ve been playing with React Native (v0.30) and had been testing my toy application on the iPhone simulator. 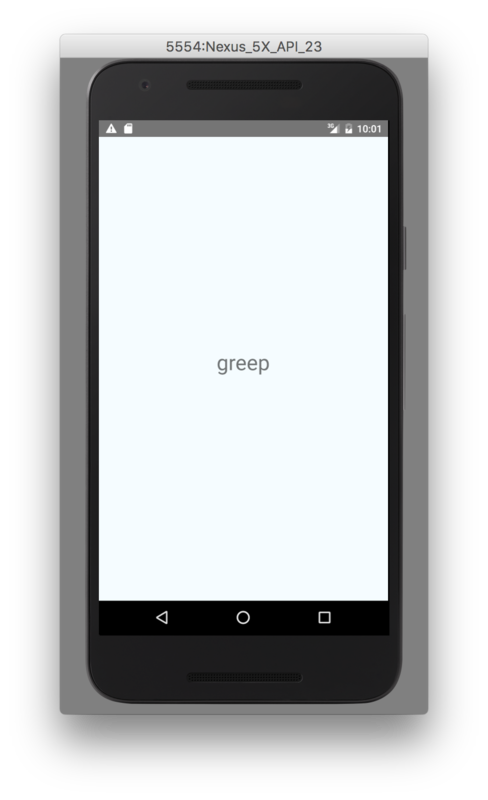 Since one of the promises of React Native is the ability to share a large amount of code between platforms, I tried to run my app on the Android emulator but ran into some minor niggles. Here is a write-up detailing the steps I took to get my React Native app to run. I had also installed the latest version of Android Studio (v2.1 as of 28 Jul 2016). 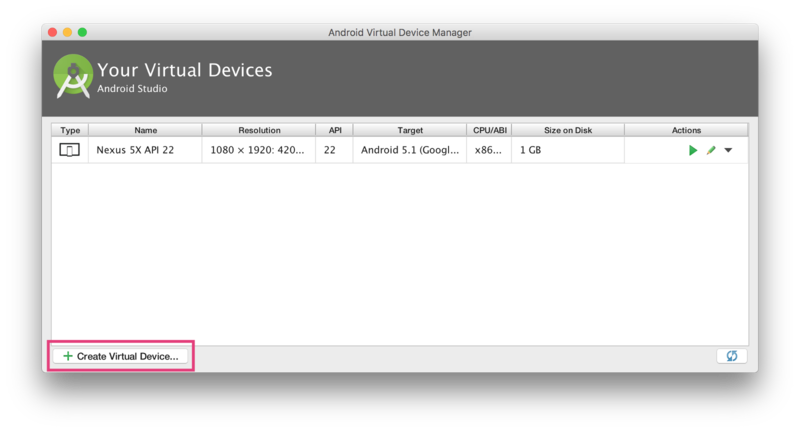 I then went to Tools > Android > AVD Manager and created a Nexus 5X image running Android 5.1 and started the emulator. 17 years of working on and off with Java and still all my woes boil down to JAVA_HOME and CLASSPATH. This time react complained about something else. I looked at the emulator image I was running and apparently I was running Nexus 5X API 22. Since react-native was complaining about android-23, I set up another emulator image and this time chose Next 5X API 23. From the next screen I again selected Nexus 5X and pressed the Next button. From this screen I first clicked the Download link next to the Marshmallow release. The Component Installer dialog popped up showing the progress of the download and installation. Once the Marshmallow image finished downloading, I clicked Finish to dismissed the dialog. With the just-downloaded image selected in the System Image dialog, I clicked Next, accepted the defaults on the next screen and clicked Finish. I then started the freshly minted Nexus 5X API 23 image and retried running my react app from the command line. However the error didn’t go away. 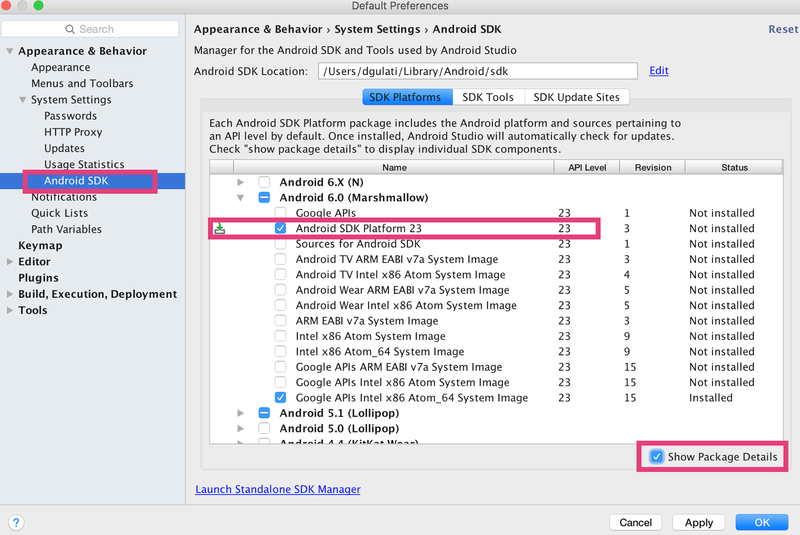 Turns out, I also needed to install the Android 6.0 (Marshmallow) API Level 23 SDK. This time when I ran my app from the command line, everything worked!